Choose between regular mail and express mail options. Weight and distance based shipping cost calculation in the shopping cart. Total closed length: 27 cm / 10.5 inch; bead size: 8 mm. Direct from Istanbul. A komboloi made of high quality well lustred bone beads of Chinese origin. 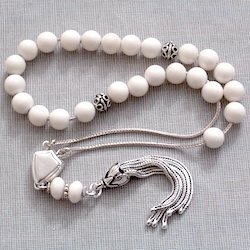 The priest bead, the tassel, two spacer beads and the thread all made of Turkish sterling silver make this komboloi a high grade collectible item.